Just moments before entering the Black Sea beach town of Tsarevo, Bulgaria, I saw a mountain biker coming up the road in my direction. As we drew closer to one another, the man approached and asked if I knew where he might be able to find some dirt trails to ride on. I wasn’t sure how to answer the man, because I didn’t know the area myself, but I told him that he we sure to find some dirt roads in the area I had just come from. So that was it. We went in different directions and I never expected to see the man again. But a little further down the road I looked back and saw that the same man on his mountain bike had turned around and was now following me. He approached and asked where I was going. I told him I was headed north toward Varna… and he then asked if he could ride with me for a while. Ready for company, but also ready for a short lunch break, I said “yes,” but also let the man know that I hadn’t eaten yet and that I was very hungry. So my new friend (his name was Martin) and I rode to the next town up the road (Lorents) where we found a small street-side cafe where I ordered a cheesy vegetable lasagne-like meal. After eating, Martin still wanted to continue riding with me… and he didn’t want to just ride with me, but he wanted to ride my touring bicycle as well! I am super hesitant about letting anyone touch my bicycle, let alone ride it. But Martin seemed incredibly trustworthy and I was surprisingly laid back about letting him ride my fully-loaded touring bicycle for a few kilometers. Plus, as part of the deal, I got to ride Martin’s lightweight mountain bike in exchange. Boy did his bicycle seem light after riding my heavy rig all the way from Istanbul! Martin ended up riding with me for the rest of the day. He didn’t actually steal my touring bicycle. We just switched bikes for a few hours. He rode on my touring bicycle and I rode on his mountain bike. We passed through several Black Sea beach towns and he even helped me find a place to stay that night in the charming little town of Primorsco. When Martin finally said goodbye and began his bike ride back to Tsarevo that evening, I was sure it would be the last time I would ever see him. But there’s more to this story. So stay tuned for my next update from the road. 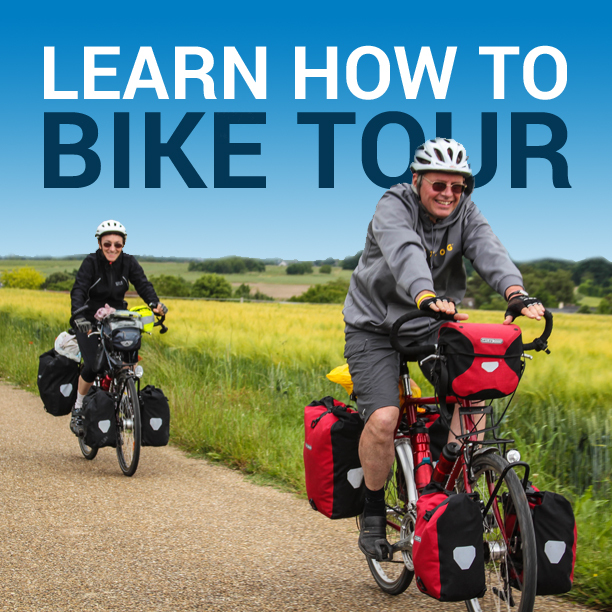 This entry was posted in Bulgaria, Darren Alff's Bike Tour Blog, Europe, Locations, Photos and tagged bicycle touring in bulgaria, bulgaria, fully loaded touring bicycle, martin, martin from sophia, stolen touring bicycle, touring bike, trading bicycles. youre crazy to let someone ride your loaded touring bike. doesnt matter who they are, even a girl i’ve had, nobody rides it. anyone even goes to touch mine they get one warning, next comes a fist then my knife. follow the hells angels on this one. those dudes stomp you sometimes to death just for putting a finger on a club bike. its your life man. P, you’re right. I rarely let anyone else touch my touring bicycle. But I have let others ride my bike in the past. It’s usually just a judgement call. It has worked out thus far, but you are right. I think people need to be very careful when letting anyone else even near their bicycle. Protect that thing as best you can. I think the knife might be overdoing it in most cases, but I certainly would be careful with leaving your bike for extended periods of time or letting other people ride your bike, etc. Do you record your route that you took to Istanbul up thru Bulgaria? That’s where my Bucket list starts after going to Russia for the Olympics. I’d like to use it as a reference if you don’t mind. Tim, this is the route I took from Istanbul, Turkey to Ruse, Bulgaria: https://goo.gl/maps/egQjz I found the route quite enjoyable.